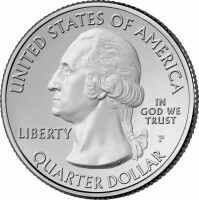 2010 was the inaugural year for the National Park Quarters and saw the first five strikes of the program released during that year. This included the Hot Springs National Park Quarter, the Yellowstone National Park Quarter, the Yosemite National Park Quarter, the Grand Canyon National Park Quarter and the Mount Hood National Forest Quarter. Those five strikes have the distinction of being the first of fifty-six due to be released in the National Park Quarter series which is known by the Mint as the America the Beautiful Quarters® Program. Under the program, five quarters are released annually honoring sites of national interest from around the United States and its territories. One site was selected from each state, one from Washington, D.C. and one from each of the five US territories. The coins release order is dictated by the order in which the honored sites came under the direct control of the federal government. As such, the Hot Springs National Park Quarter was the first to be released as the site was granted federal protection on April 20, 1832. Conversely, the last coin to be released in the program will be the Tuskegee Airmen National Historic Site Quarter, scheduled for 2021, with that site only being established on November 6, 1998. All of the sites are honored on the reverse (tails side) of the fifty-six quarter dollars issued in the series with a design emblematic of that location. The obverse (heads side) of each coin will contain the same design, a portrait of George Washington, the first President of the United States. This image of Washington was initially used on the circulating 1932 quarter dollar and was designed by John Flanagan. 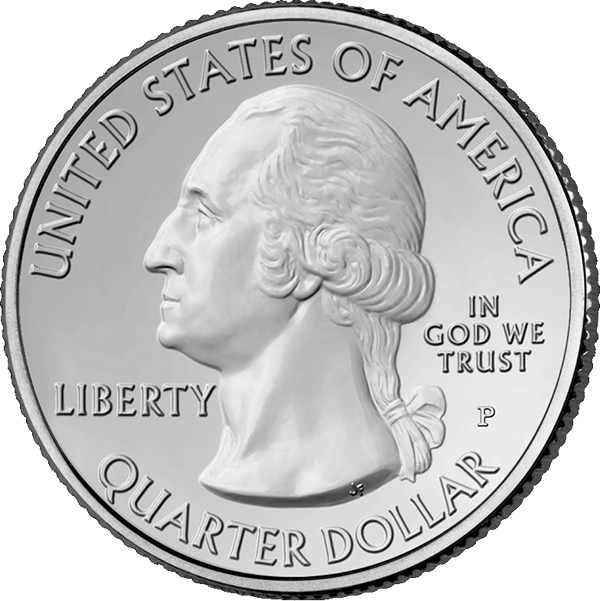 The same portrait has been used on the quarters ever since 1932, with some modifications occurring in 1999 as part of the 50-State Quarter series. The Mint releases the National Park Quarters in intervals throughout the year. Coins are distributed into circulation by the Federal Reserve Banks who ship them, as needed, to local banks for use in everyday commerce. On or about the same day as the National Park Quarters enter circulation, the Mint also typically has an official launch ceremony for the strike. These ceremonies are usually held at the location which is currently being honored on the new quarter, or at a site close by. Hot Springs National Park Quarter – The Hot Springs National Park Quarter was released into circulation on April 19, 2010 with an official launch ceremony occurring the following day. The coins honored the national park which is located in the state of Arkansas. 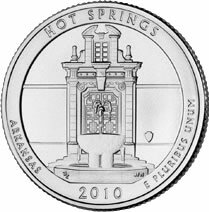 Shown on the reverse of the coin is an image of the facade of the Hot Springs National Park Headquarters Building with a thermal fountain in front of it. The reverse was designed by United States Mint Sculptor-Engraver Don Everhart and sculpted by Sculptor-Engraver Joseph Menna. Yellowstone National Park Quarter – The Yellowstone National Park Quarter entered into circulation on June 1, 2010 honoring the national park which is located in the state of Wyoming. A ceremony held at the park was hosted by the Mint on June 3, 2010. 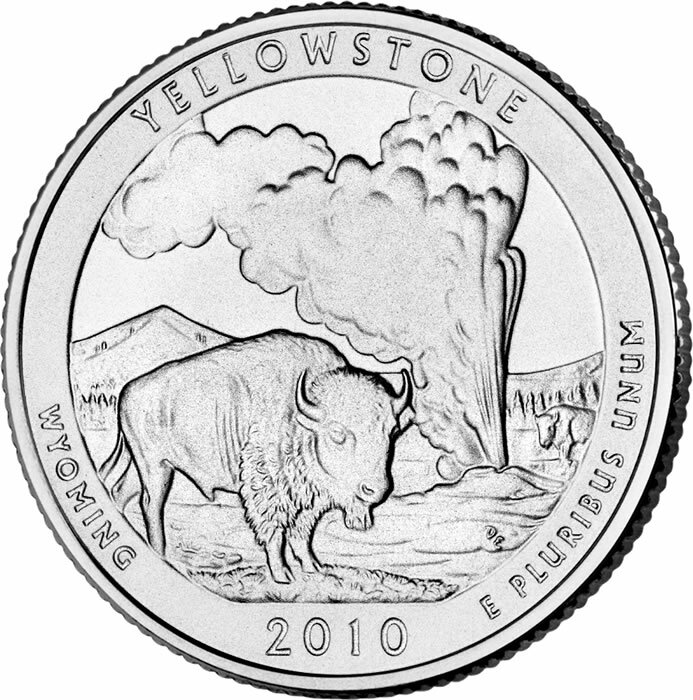 Depicting two of Yellowstone’s most famous icons, the reverse of the Yellowstone Quarter shows two American Bison with Old Faithful Geyser. The reverse was designed and sculpted by United States Mint Sculptor-Engraver Don Everhart. 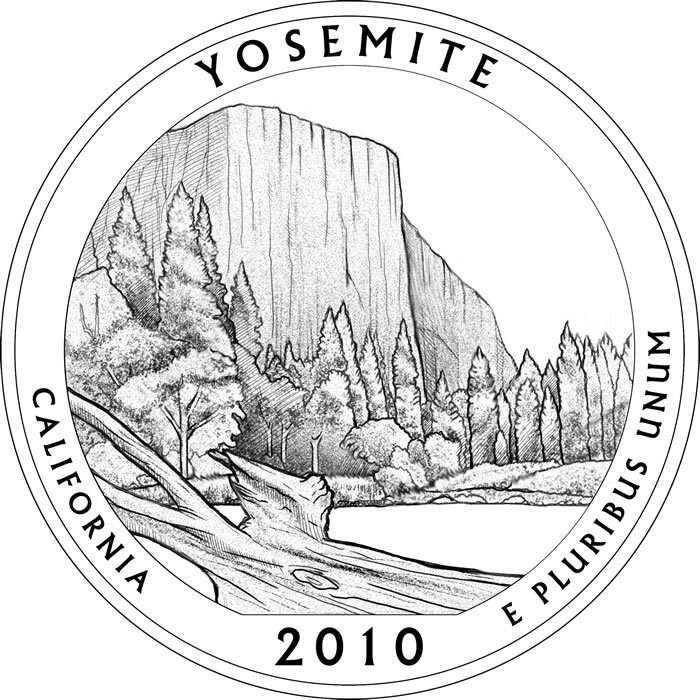 Yosemite National Park Quarter – The Yosemite National Park Quarter honors the national park located in the state of California and was released into circulation on July 26, 2010. The Mint held the official launch ceremony three days later on July 29, 2010. For the reverse of this quarter, a view of El Capitan was shown. This massive granite cliff serves as an icon for the park and can be seen from the Yosemite Valley where most visitors spend their time in the park. The reverse was designed by United States Mint Sculptor-Engraver Joseph Menna and sculpted by United States Mint Sculptor-Engraver Phebe Hemphill. Grand Canyon National Park Quarter – The Grand Canyon National Park Quarter first entered into circulation on September 20, 2010 with an official launch held by the Mint on September 21, 2010. The coin honors the national park located in the state of Arizona. 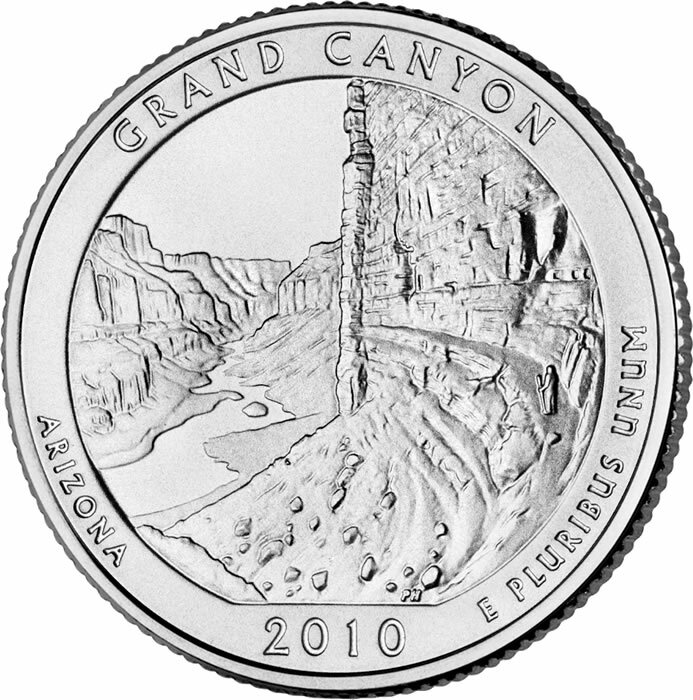 Showing just a portion of the Grand Canyon, the reverse of the coin depicts the granaries above the Nankoweap Delta in Marble Canyon near the Colorado River. It was designed by United States Mint Sculptor-Engraver Phebe Hemphill. 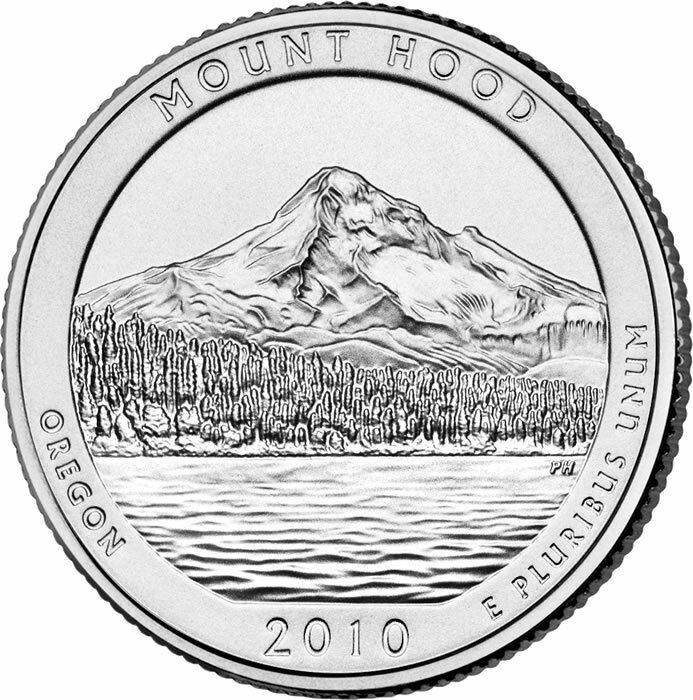 Mount Hood National Forest Quarter – Honoring the first non-National-Park site in the program, the Mount Hood National Forest Quarter was released into circulation on November 15, 2010. The Mint held the official ceremony for the launch on November 17, 2010. Depicted on the reverse of this quarter is Lost Lake with the large Mount Hood shown off in the distance. The reverse of the Mound Hood Quarter was designed and sculpted by United States Mint Sculptor-Engraver Phebe Hemphill.